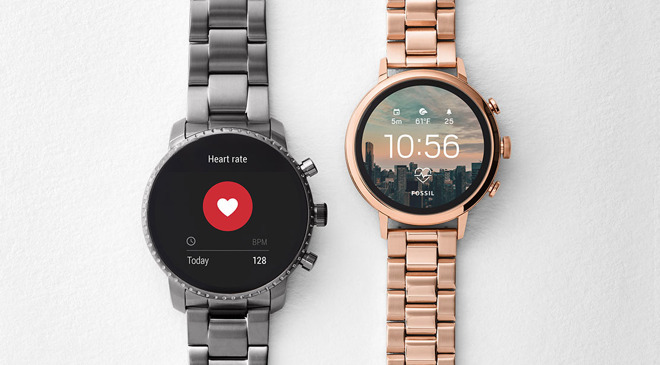 The purchase will see members of Fossil's research and development team move over to Google, along with the IP, which is apparently for smartwatch technology that has yet to appear in a commercial product. The deal is expected to be finalized later this month, though relatively few details about what the IP is for have been released, except that it is a product line. The IP is based on a technology that Fossil acquired as part of its purchase of wearable devices startup Misfit in 2015, a deal itself worth $260 million Fossil EVP and chief strategy and digital officer Greg McKelvey advised to Wareable. "It's based on something out of our timeline, it's new to the market technology and we think it's a product that has features and benefits that aren't in the category today," claims McKelvey. Google VP of Project Management of Wear OS Stacey Burr advised to the report the new product line will work within the existing Wear OS ecosystem, devices running on Google's wearable device operating system formerly known as Android Wear. "We saw some technology that they were developing that we thought could be brought out in a more expansive way if Google had that technology, and was not only able to continue to use it with Fossil but bring it to other partners in the ecosystem," notes Burr. "It's about bringing great features to the widest numbers of on-the-go consumers." Fossil is still planning to launch multiple devices using the unnamed technology, with the firm still focused on finishing its development. McKelvey adds "The Fossil Group will bring the product to market, across our full breadth of brands over time, and then in true Google fashion, the technology will be expanded across the industry over time to benefit all." There have been rumors Google would produce its own Pixel-branded Wear OS smartwatch, putting Google directly in competition with Apple in the wearable device space instead of allowing third-party vendors to use its operating system. While it is unclear if the Fossil deal will impact that alleged device, Burr stressed the technology resulting from the purchase would be made available to all existing and future partners. We'll see if this is a smart move. There fixed it for you McKelvey. Motorola, Boston Dynamics, Google Fiber the list goes on. It seems anything that actually takes work to accomplish Google gives up on, with the noteable exception of using user data to sell ads. Competition is ALWAYS great for consumers, I love my Apple Watches, but curious to see what Google is able to achieve in the future. Their current wearables are pretty bad. Their current wearables are pretty bad. Because they're not a design company. They're a data-mining, ad-supported, Internet search company. Google Fiber is still a thing, just not rolling as quickly as they started out doing. The entrenched companies like Comcast and Spectrum and Verizon used a multitude of delay tactics to keep Fiber off "their poles" and out of their markets. But Google's Fiber ambitions are not dead. Between a significant investment in Musk's StarLink and the purchase of Webpass it appears they'll add some tactics of their own to bypass those traditional providers roadblocks and finish that last mile. Getting rid of Boston Dynamics made sense to me since it had taken on creepy and potentially militaristic tones with the humanoid like robots we've seen on YouTube. Same with Schaft. Developing human and animal-like robotic hardware isn't a good match for Google IMO and with Rubin gone it was time for a change, especially as Google was making a clean break from any potential military partnerships. But the software teams they acquired are still actively developing robotic tech with either 5 or 6 robotics companies under their wing in the XLabs. A lot of it will end up in their AI-driven products. Motorola? I suppose the company itself outlived it's usefulness. They acquired them at a critical junction in the smartphone patent wars, and it helped end the IP battles. Soon after Google and Apple called a truce and new fights were no longer breaking out among OEM's. Google obviously didn't give up on building smartphones tho after they gave up on Moto. They retained all the needed IP, hired away Moto's hardware guru, and acquired the necessary engineering talent to design new smartphones and features in-house, all while shedding the ponderous manufacturing structure, IP licensing management, and sideline businesses like cable boxes that came bundled with Motorola. It no surprise when a plan doesn't stick to the script. If the basic idea was a good one to begin with then smart companies don't abandon it, just pause and rework some of the screenplay, maybe bring in some new writers too. That's what Google appears to be doing with smartwatches. They have little chance of "beating Apple" at it of course, but I'd really doubt that's the intent as it would be a silly reason. They can be successful and even find niches where they can dominate without being Number One. This will not compete with Apple Watch but rather Samsung's Watch. Apple is immune as long as Android is at war with each other. They can be successful and even find niches where they can dominate without being Number One. But it's odd that pundits don't apply the same rule to Apple. One should also bear in mind that this is an IP buy, not a buying the division outright, so there's a possibility that changes will be under the hood. (Again, this is often the case when Apple makes acqi-hires), rather than immediately customer-facing. It's more akin to the deal they made with HTC: Buying some IP, licensing other patents, and acquiring engineering staff from Fossil too. Reading between the lines it seems to me they have a very specific device in mind, with some features from it being made available to OEM's at large. ....Where companies go to die. Competition never drives Apple. Despite what the internet professionals tell you. As long as they don't make a knockoff Apple Watch they're ok. Which is why Fitbit copying Apple is giving them massive sales. "But the knockoff made it better!" "It does the same things!" "Google pays Fossil $40M for smartwatch IP to compete with Samsung" There I fixed it for you. There's nothing Fossil can offer that will allow Google to come even close to Apple Watch capabilities, perhaps manufacturing quality, but not on features. Always liked Fossil watches (had a few in the past), sad they felt they had to partner with the devil going forward. Won't ever view them in the same way again. Well that was $40M pissed away...Way too late to enter the Watch game. This is just like Microsoft entering the smartphone space 4yrs after the fact. As Ars Technica says, "A deal with a fashion brand isn't going to fix a dead hardware ecosystem." Android Wear is pretty much irrelevant in the SmartWatch market dominated by Apple (41% marketshare) and Fitbit (21%) watches. Fossil, who is number 3 in the smartwatch rankings only managed a measly 4% marketshare with Android Wear as a whole basically Missing in Action. Even Samsung uses their own Tizen platform rather than Android Wear. Android smartwatches have been an utter failure resulting in Qualcomm releasing exactly the same SoC (System on a Chip) to power AndroidWear watches for the last 3 years with nothing but a name-change each year. As result, AndroidWear devices have dreadful performance and features and are massive dinner plates on a user's wrist completely outclassed by Apple's Series 4 Watch with its 64bit class-leading in-house SoC. As a result, this Google Fossil deal is not expected to mean much in the real world. I love my Fossil watches too, but I'd never get a Fossil Smart Watch. I bought a Fossil smartwatch before I pulled the trigger on my AW3 and I loved that thing. The one thing that still has me wearing it every once in a while is the fact it looks like a traditional watch, with an actual face and hands. No it couldn't do things like stream music or tell me stock prices but it did allow me to get text and call alerts and would tell me who was calling (preset people, up to 6 which are assigned a number and the hands would line up pointing to that number when they call/text). So I still wear it when i want to be a little more dressy, and their tech works. This is a good pickup. If someone can make a watch that works as well as the AW, and make it look more traditional and less "80's calculator" I would be interested.